The charming Hanoverian stallion Doctor Wendell MF is the first licensed son of the Grand Prix dressage stallion Don Principe. 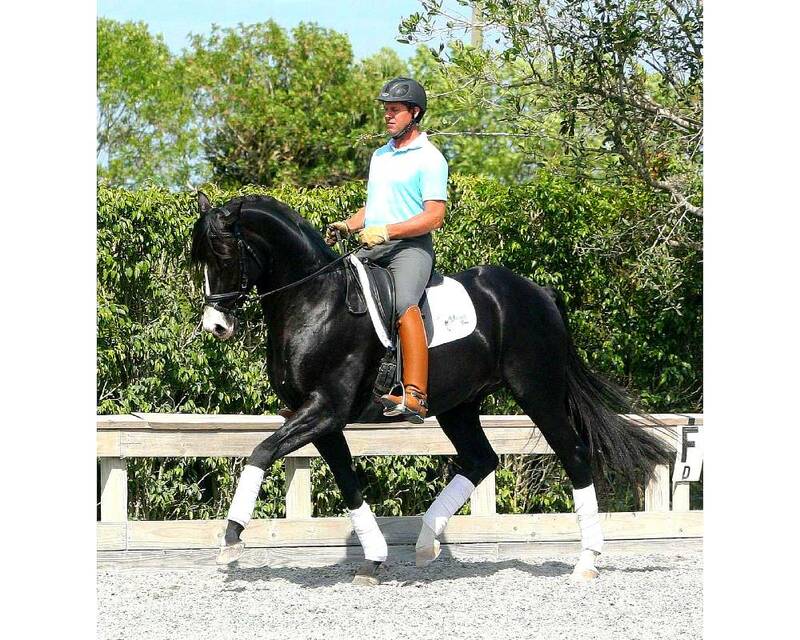 Don Principe has been a successful Grand Prix competitor with multiple riders and has earned scores as high as 76% on the winter Florida circuit. Don Principe is by the legendary Donnerhall, winner of many World Cup, World Championship, and German Championship titles under Karin Rehbein. Don Principe shares a grandsire with Hilltop Farm's Royal Prince as he is out of the States Premium mare Papagena, a daughter of the Thoroughbred stallion Prince Thatch. Prince Thatch stood at Celle for a number of seasons and has been ranked as high as #9 on the VhW's listing for production of dressage horses. Papagena's grandsire is Durkheim, another stallion stationed at Celle for many years. Durkheim was known for his production of dressage and eventing horses and was sire to the well-regarded US-based stallions Diamont and Domingo. Doctor Wendell's damsire Sandro Hit is known for producing Premium foals, high-priced auction entries, and successful FEI dressage horses. At the 2012 Olympic Games in London there were three Sandro Hit offspring competing — Sandro Boy, Sancette, and Santanna. The granddam to Doctor Wendell, SPS Doreen, is a full-sister to the approved stallion Don Hill. Doctor Wendell has been very successful at Breed Shows as a youngster including winning the 2010 USDF/GAIG East Coast Colt/Gelding Reserve Championship and the USDF Horse of the Year for Two-Year old Colts/Geldings. At the 2011 Dressage at Devon, he won the Colt/Gelding Championship and was Reserve Champion Young Horse. That same year, Doctor Wendell was also the American Hanoverian Society Champion for 2 & 3-year old Colts/Geldings and Champion in the Colts/Geldings Materiale division, as well as the USDF Reserve Champion for the 3-year old Colts/Gelding In-Hand and Materiale divisions. Doctor Wendell's promise in-hand has developed into a very successful competitor who routinely scores in the 70s. In 2013 Doc qualified for the USEF/Markel Young Horse National Championships. The high quality of his canter was especially praised by the judging panel and Doctor Wendell finished in 6th place overall. The following year, Doctor Wendell finished 5th in the FEI 6-Year Old National Championships under rider Jim Kofford. They finished the season winning the USDF Region 2 Third Level Championship and placed 6th in the USDF National Third Level Finals. Doctor Wendell's modern type, quality of movement, and jumping ability have impressed inspection officials and he was accepted for breeding by the AHS, GOV, and ISR/Oldenburg in 2012. His canter and walk are particular strengths and he was awarded scores of 8 and 9 for those gaits, but he also shows good talent through the jump chute. The Doctor Wendell foals are already making a strong impression. His oldest offspring, the 2013 colt Debonair MF (ds. Rotspon) was a highlight at the Border Line Dressage Breed Show in 2014 winning the Yearling Colts/Geldings, Colt Championship, Young Horse Championship, and taking Reserve in the Grand Championship. The 2014 filly, Danae MF (ds. Rotspon) was the USDF Traveling Trot Perpetual Trophy Winner as the highest-scoring in-hand horse of any age.